Hard drives have been 100% professionally wiped and certified to Department of Defense standards! Quick and well-constructed, this Toshiba 450 GB hard drive is ideal for people who need more data storage without a hassle. 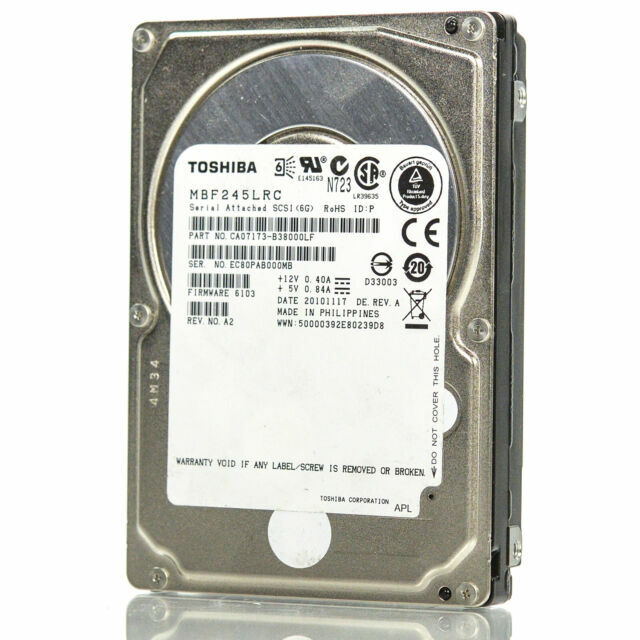 This Toshiba 450 GB hard drive is an outstanding pick when you want to provide high-performance data storage. Small business owners and technophiles alike can take advantage of the design and specifications of the Toshiba MBF245LRC. This internal 2.5-inch hard drive includes very large storage space, so you can hold onto all of your large files, large multimedia files, and software applications with more than enough space leftover. The Toshiba MBF245LRC is highly reliable, with great build quality, which means you are able to benefit from sustained maintenance-free performance without problems from data errors or disk crashes. The ultra-fast 10000 RPM disk speed included with this internal 2.5-inch hard drive allows you to access massive games, documents, and videos very rapidly. You can eke out even better data access speeds when loading software, downloading music, or watching videos since this Toshiba 450 GB hard drive features a 16 MB RAM buffer. Plus, the Toshiba MBF245LRC is a breeze to install, so you can simply swap it into computers supporting SAS 2 and SAS interfaces.